This example shows how you can fit the dynamic Nelson-Siegel (DNS) factor model discussed in Koopman, Mallee, and Van der Wel (2010). The following DATA step creates the yield-curve data set, dns, that is used in this article. 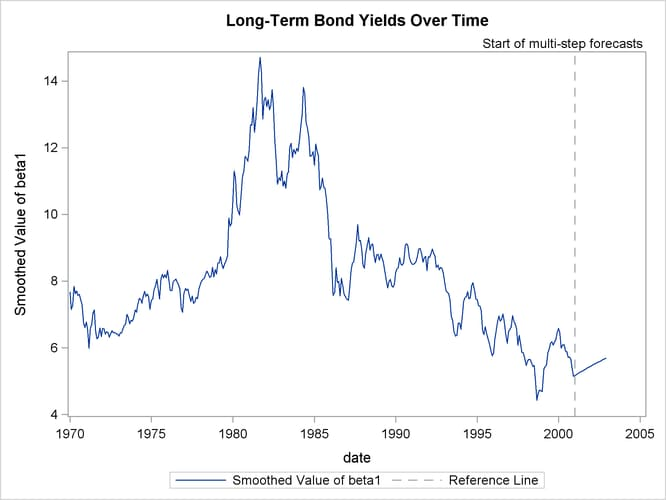 The data are monthly bond yields that were recorded between the start of 1970 to the end of 2000 for 17 bonds of different maturities; the maturities range from three months to 10 years (120 months). The variable date contains the observation date, yield contains the bond yield, maturity contains the associated bond maturity, and mtype contains an index (ranging from 1 to 17) that sequentially labels bonds of increasing maturity. 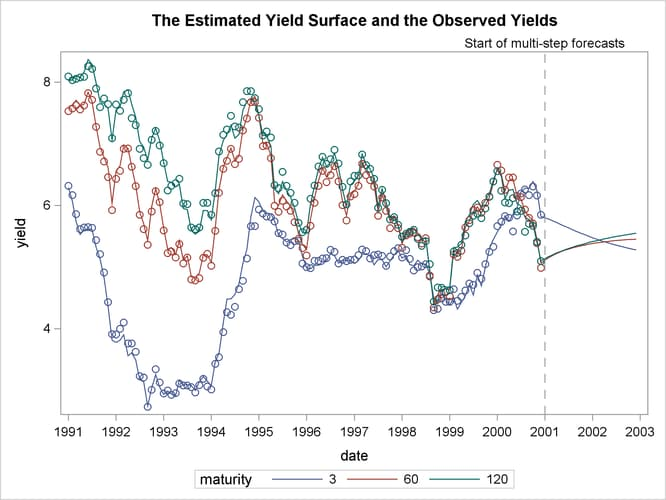 The data have been extended for two more years by adding missing yields for the years 2001 and 2002, which causes the SSM procedure to produce model forecasts for this span. where are zero-mean, independent, Gaussian variables with variance , and is a three-dimensional, Gaussian white noise. That is, is a VAR(1) process with mean vector . The remainder of this example explains how to use the SSM procedure to fit this model to the yield data in the dns data set. The underlying six-dimensional state vector is formed by joining the two independent subvectors, (which is a zero-mean, VAR(1) process) and the constant mean vector . That is, . for some parameters and the B-spline basis functions (of time) . Thus, the variables Z2 and Z3 become known functions of time, except for the parameters , which are estimated from the data. The following statements augment the dns data set with the B-spline basis columns in two steps. First a data set that contains the basis columns, c1–c7, is created by using the BSPLINE function in the IML procedure. This data set is then merged with the dns data set. The DBLDOG optimization technique is used for parameter estimation since it is computationally more efficient in this example. The transition matrix, , in the VAR(1) specification of is taken to be diagonal (TYPE=VARMA(P(D)=1)) because the use of more general square matrix did not improve the model fit significantly. The mean vector (recall that ) is specified as a three-dimensional random walk with zero disturbance covariance (signified by the absence of COV= option). The model specification part of the program ends with the MODEL statement; the subsequent COMP and EVAL statements define some useful linear combinations of the underlying state. Their estimates are computed after the model fit is completed and are output to the output data set dnsFor. The dnsFor data set also contains all the program variables and the parameters defined in the PARMS statement because the OUTPUT statement contains the PDV option. Output 27.7.1 shows the estimated mean vector ( ). It shows that the mean long-term yield is . Output 27.7.2 shows the estimates of v1–v7 (used for defining time-varying ) and the maturity specific observation variances. Output 27.7.3 shows the estimate of the VAR(1) transition matrix , and Output 27.7.4 shows the associated disturbance covariance matrix . The model fit summary is shown in Output 27.7.5. The following statements produce the time series plots of the smoothed estimate of the idealized bond yield ( ) for bonds with maturities 30, 60, and 120 months (shown in Output 27.7.6). To simplify the display, the plots exclude the time span prior to 1991. 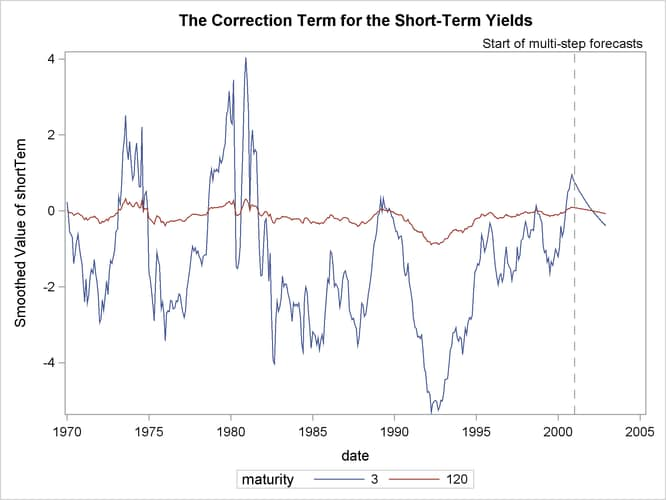 Similarly, Output 27.7.8, which is produced by the following statements, shows the smoothed estimate of the correction to the overall yield that is provided by the second term ( ) for maturities of 3 months and 120 months. As expected, the correction for the (long-term) maturity of 120 months is negligible compared to the (short-term) maturity of 3 months.